Reverend Darryl L. Ervin Sr. was born on September 16, 1962. He is a native of Birmingham, Alabama who was nurtured in the East Birmingham and Norwood neighboring communities. He is the fourth child of five to the union of Annie L. Ervin, and the late Eddie Ervin Sr. He attended local area public schools and is a graduate of Phillips High School, Birmingham, Alabama. 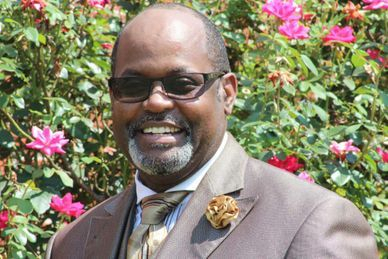 He eagerly earned a bachelor’s degree from Miles College in Fairfield, Alabama, and is currently pursuing his Post-graduate Studies at Hood Theological Seminary in Salisbury, North Carolina. In December 2001, he preached his trial sermon, “You Can Run, But You Can’t Hide.” Reverend Ervin continued his faithful walk of service as an Associate Minister at his home church, Gaines Chapel AME Church, Forestdale, Alabama. In November 2009, while continuing to serve, he heard another voice and it was the voice of Bishop James Levert Davis who recognized that having been faithful over a few things, charged him to go out and work in the vineyard serving at Hopewell AME Church, Florence, Alabama; Hopewell AME Church, Brundidge, AL; Mt Zion AME Church, Louisville, AL; Bethel AME Church, Dolomite, Alabama. In 2018, Bishop Harry L. Seawright appointed him Pastor of the Historic Ward Chapel AME Church, Prattville, Alabama. His charismatic style of preaching and humble personality filters over into his sermons as he often uses practical anecdotes to capture the attention of the congregation; “so it is in the natural, so it is in the spirit.” He is supported in ministry by his wife, Dorothy, his mother, 8 children, and 12 grandchildren. His ultimate desire is to see people fully embrace God’s love and to walk in victory and power while experiencing the fullness of God’s promises.